In Alaska, it's not strange for wildlife like polar bears to wander onto an airport's runway. But a lounging seal is far stranger. But that's what workers found at the airport in the nation's northernmost city. A seal was taken off of the runway at the airport at Utqiagvik (pronounced (oot-GHAR'-vik). It was taken by way of sled, KTVA reported. It was estimated to weigh 450 pounds. A photo and video of the bearded seal was shared by Scott Babcock on Facebook. It was lounging on the runway. It was in the town formerly known as Barrow. The state Department of Transportation got in on the fun by warning pilots of "low sealings" at the airport. Meadow Bailey is the department's communications director. She said Utqiagvik experienced heavy storms. It is an Arctic Ocean coastal community on Alaska's North Slope. Staff found the seal while clearing the runway. The department's staff members are not allowed to handle marine mammals. So the seal was removed by North Slope Animal Control. The workers have seen birds and caribou. They have seen polar bears and musk ox. These have all been on the runway. But the seal sighting was a first, Bailey said. "Wildlife strikes to aircraft pose a significant safety hazard and cost the aviation industry hundreds of millions of dollars each year," Bailey said. "Birds make up over 90 percent of strikes in the US, while mammal strikes are rare." 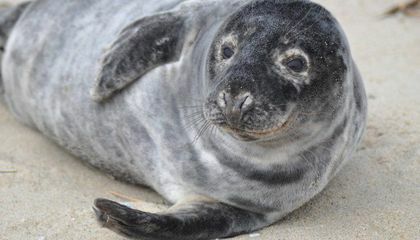 What might have caused the seal to find its way onto the airport runway? I think that it is kind of funny that a seal was found lounging in a runway. But I'm also glad that it was removed because it could have been seriously hurt. They say that polar bears, caribou, birds, and musk ox, but never a seal. MY OPINION IS: That this is really strange. like how could a seal wander over to a air port run way!! But the only thing that's important is that the seal is safe. I found this article kind of funny. It was funny to me because the seal was just laying on the runway by himself. This wouldn't be funny at the same time because if a plane was coming in. What would they do with seal before you know... it dies. Would they remove it quickly or hope for the best? So im still debating on if I like this article or not. The seal was probably just wandering around with no idea what it was getting itself into. I'm just glad it was seen and removed before something tragic happened. It probably got lost and didn't know its way and found it. But if the polar bears are in the middle of nowhere in Alaska there might be an airport for it to find. " In Alaska, it's not strange for wildlife like polar bears to wander onto an airport's runway". They might just get lost or it saw a plane take off and followed it. 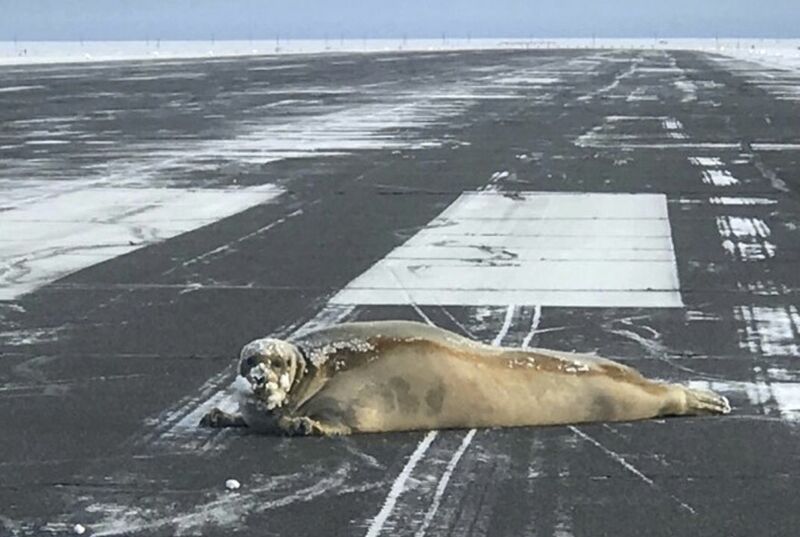 I think that it's weird that they found a seal on the runway. I don't know how it came all the way from the sea. I have no idea what might have caused the seal to wander onto a busy, not to mention extremely noisy, runway. My best guess is that it was either looking for food, or trying to escape from an aquatic predator. That must be sad, I hope the seal is OK. It must be weird for a seal on a runway would they be so kind of fiance around the run way.